Madam Speaker, I am joined by the co-chairs of the Congressional Serbian Caucus, Representatives Melissa Bean of Illinois and Dan Burton of Indiana, in honoring a treasured constituent of mine and one of the unsung heroes of World War II, retired Major George Vujnovich. 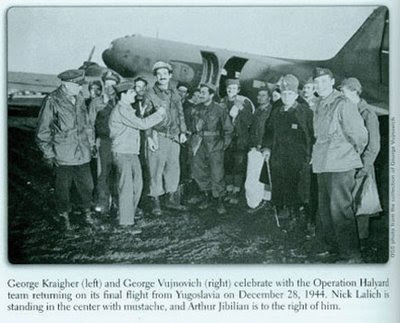 Major Vujnovich, a proud Serbian-American, was instrumental in 'Operation Halyard' and one of the last surviving members of that successful wartime mission. In the summer of 1944, Americans and Allied airmen flew hundreds of sorties over Europe with the aim of disrupting the Ploesti oil complex, Adolf Hitler's most important oil pipeline. During their treacherous journey from Italian bases to the Romanian oil complex, 1,500 of our brave men were forced to bail out over Yugoslavia. Scores of American crewmen were trapped behind enemy lines and dependent on Serbian villagers to hide them from the Germans. Although Yugoslavia was enemy territory at the time, much of the country's Serbian regions remained under the control of Yugoslav guerilla resistance leader General Draja Mihailovich and his Chetnik forces. General Mihailovich remained loyal to the Allies, and under his orders the Serbian people shielded these airmen and protected them from capture and imprisonment by German troops. General Mihailovich passed information about the downed American airmen to the United States authorities. The Office of Strategic Services (OSS) put together Operation Halyard, a daring mission to save the men without drawing the attention of the Nazis. The mission entailed flying and landing C-47 cargo planes into enemy territory, picking up the downed airmen, and flying back to allied territory. Before the mission could go forward, however, the Allied forces cut ties with General Mihailovich and no longer had specific information about the location of the American airmen. Major George Vujnovich, the OSS operation chief stationed in Bari, Italy, discovered that Mihailovich was hiding the airmen near his headquarters in the city of Pranjani. He informed U.S. officials of their location and Operation Halyard progressed. As the mission advanced, Major Vujnovich's experience and expertise were indispensable. Major Vujnovich was responsible for selecting members of the Halyard Mission, and orchestrating the initial parachute drop into the area. The rescue plans hinged on his direction and the ability of local Serbs to build an airstrip without any modern tools and without German detection. 'Operation Halyard' took place between August and December 1944 and was a complete success. Hundreds of men were rescued behind enemy lines and no lives were lost in the mission. The Halyard Mission was a success thanks to the brave men and women of the OSS and the courageous Serbian locals who risked their lives to safeguard American airmen. Thanks to a keen mind and tactical expertise, Major Vujnovich demonstrated the courage and selflessness that mark him as an American hero. Major George Vujnovich was born to Serbian parents in 1915. In 1934 he received a scholarship from the Serb National Federation and left his home in New York to attend college in Belgrade. While living in Belgrade, Mr. Vujnovich met and married his wife, Mirjana. Their life was disrupted in 1941, when the German Luftwaffe bombed Belgrade in Operation Punishment. Mr. Vujnovich was a first-hand witness to the bombing, nearly losing his life when a falling bomb destroyed a nearby streetcar. After the bombing, Mr. and Mrs. Vujnovich fled Yugoslavia, and he accepted a job in Ghana as assistant airport manager while Mirjana moved to Washington, DC to work at the Yugoslav Embassy. When the US entered the war, Mr. Vujnovich received a commission as a second lieutenant and assumed command of an airbase in Nigeria. While working at the airbase, he was recruited by the OSS for the clandestine services, and was later sent to the OSS post in Bari, Italy. From this post he saved the lives of his fellow servicemen and earned the title of hero. I am honored to have this opportunity to acknowledge Major Vujnovich's contribution to the Halyard Mission. 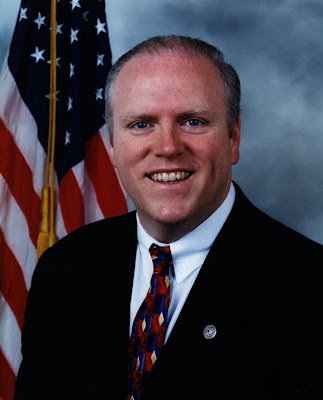 "Congressman Joseph Crowley was elected to the United States House of Representatives in November of 1998 to represent the Bronx and Queens based Seventh Congressional District. Congressman Crowley has used his position on International Relations and his co-chairmanship of the Congressional Ad-Hoc Committee on Irish Affairs to expand on his past work in Irish affairs. In addition to leadership for justice and equality throughout all of Ireland." A sincere 'Thank You' to Congressman Crowley for honoring the contribution of Major George Vujnovich to the success of the Halyard Mission Rescue Operation and for also recognizing the contribution of General Mihailovich and the Serbian people to the rescue of hundreds of American airmen from behind enemy lines during WWII. Photo of wreath laying at Daley Plaza, Chicago to honor the Halyard Mission heroes in 1994 during the 50th anniversary commemoration of D-Day, featuring Major Richard L. Felman, U.S.A.F. (ret.) kneeling and Major George Vujnovich standing with his hand on his heart taken by Aleksandra Rebic.